Landscaping is not the first thing that comes to mind when patrons walk into a restaurant. Typically, they are more concerned about dining, then taking in the surroundings. But this doesn’t mean that restaurant landscaping should not be a priority. Landscaping is one of the first visual impressions your patrons get. Why not make it beautiful and welcoming? Even if your patrons don’t verbally express their love of your restaurant’s landscape, mentally they appreciate it! 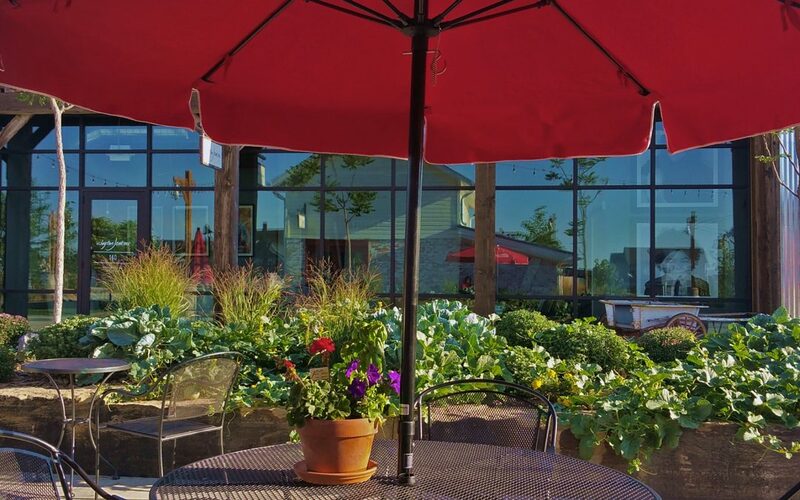 This post answers the question of how restaurants and landscaping go together and provides some great ideas on how you can improve the current landscaping! Every restaurant should adorn its front entryway with greenery. Even if all you have space for is a few simple planters to either side of the front door, your customers will feel more at ease and thus receptive to the culinary treats to come. Some restaurants have an outdoor space for benches where those on a waitlist can sit. This is a perfect opportunity to make them feel welcome with plants. It is known that plants are calming, so why not use them to reduce the stress of being on a waitlist? One great place to display landscaping acumen is on an outdoor patio. An important thing to remember when planning landscaping for a restaurant patio: think of what flowers and plants you want and if they tend to attract bees. Bees, as important and wonderful as they are, annoy guests leading to an unpleasant dining experience. Whether over your front door or covering outdoor seating, a trellis offers the opportunity to add greenery to your restaurant space. If you have an outdoor space for hosting events, a trellis might be a focal spot for a wedding, a band, or a featured speaker. When placed over the front door, your plants will greet each guest with a wash of fresh oxygen and a subtle reminder of nature. Just remember to keep them out of the way and tactfully pinned back. Growing fresh vegetables and herbs on site is becoming increasingly popular. With a nominal investment, a restaurant can integrate a hydroponic or aquaculture system into their physical space. Not only will customers delight in the novelty, but the gentle sound of the water will soothe them and add to the dining experience. And trust us, nothing is better than freshly picked fruits, vegetables, and herbs. With a vertical system, you can grow beautiful greens, strawberries, and more. The kitchen staff can harvest produce as needed throughout the day and make seasonal planting recommendations. It will also double as a great talking point for restaurant staff and diners! A great way to keep your guests looking forward to returning visits is by switching up your restaurant’s landscaping. Plants and flowers can be planted with seasonality in mind, meaning the landscaping will always keep up with the seasons. For a more personalized take on seasonality consider updating planters as the seasons change. This will give you or the restaurant staff a chance to play around with colors and textures; your guests will be sure to notice! We are leaving summer behind and welcoming in fall, so why not get creative and start thinking about how you could incorporate fall foliage into your restaurant’s landscaping? Everyone loves the gentle sound of falling water and it has the ability to soothe your guests. The great news is adding a water feature to your current restaurant landscaping is easy. There are small waterfalls you can purchase and place throughout your restaurant, or you might opt for a larger fountain to serve as the centerpiece of your patio. You can also incorporate a babbling brook that runs all around the property or go wild and install a koi pond. Whatever you choose to go with, know that some extra maintenance will come along with it. If you are ready to impress your restaurant guests with beautiful landscaping, give Crowley Landscape a call today. We are ready to help with your restaurant landscape design! We also offer maintenance for current business landscaping. We will keep your restaurant looking fresh and invigorated!